The inside base of the cooker and underside of the lid are lightly ribbed to show some lovely light grill markings on your cooked food. The included tool is double ended. 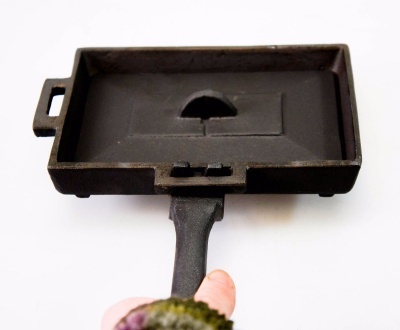 One end is used to lift the cooker out of the fire, and the other end is for lifting the lid and applying pressure. Cast iron is the best, traditional cookware you will ever find. 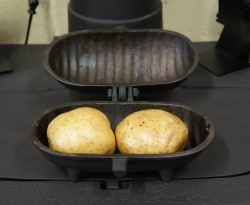 Build up your seasoning for a natural non stick coating. Simply oil lightly like a wok before and after use which protects and seals the metal. 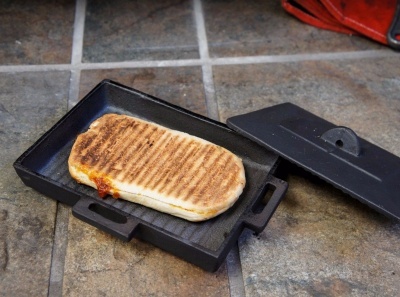 To cook a panini, put the set inside your wood burning / multi fuel stove directly on top of burning fuel (at a medium burn rate). It'll take 5 > 10 minutes to get REALLY hot. Remove the unit from the stove with the tool. Place on hearth. 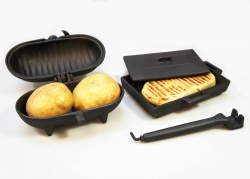 Remove lid and insert panini. Replace lid and apply light pressure using the tool. Takes 1 > 2 minutes. 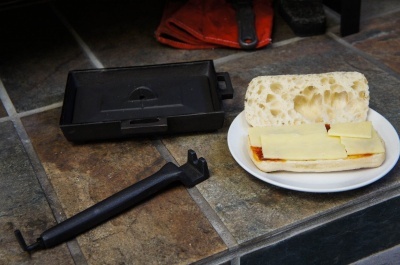 If your cast iron panini cooker is TOO hot, leave for approx 60 seconds on the hearth before putting panini in. If not hot enough, you can put it back inside the stove for 30 seconds or so with panini inside to finish off. 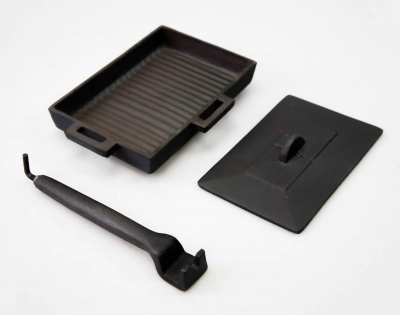 This item can also be used for cooking chicken fillets, burgers, fish and many other things when placed on top of the Hellfire Grill base (see our other listings - the grill base is NOT included with the panini cooker) with glowing embers underneath and fire to the side. This allows control of cooking rate and heat for cooking burgers, meat etc.